How to Participate in a Large Conference Call? Holding meetings over the phone have become the norm due to the multiple benefits that come with large conference calls. With audio conferencing, a company can cut back on costs and it’s a lot easier to connect remote workers with office employees. However, there are still a huge number of employees who experience difficulty participating in large conference calls. 1. Check everything and fix any technical difficulties before the conference call. Having a discussion with a large group of people is difficult enough, more so, if you’re not prepared. Before starting the call, it’s important to prepare and check everything in order to prevent sudden interruptions from taking place. Make sure that the equipment you use, such as your phone, is functioning properly to avoid dropped calls as this will make you seem unprofessional. Take note of how to prompt the operator or tech support in case of any mishaps during a call. This is usually announced before a conference commences. You should also review the agenda beforehand so you could participate more actively in the conference. Avoid causing delay to the conference call by showing up on time. Even if you’re not the host, it’s important to be punctual as this will not only save your time but others as well. Moreover, if participants keep on showing up late, it could cause multiple distractions and the presentation may take longer. 3. Follow any tips or instructions given by the operator prior to the live call. Before entering a live a call, everyone on the call are usually given a set of instructions on what to dial or do in case they need any assistance from the operator. Furthermore, additional advice on how to participate in the live call are sometimes provided. Make sure that you pay attention and follow the provided instructions as this will not only make the conference call easier for the moderator but for you as well in case you encounter technical difficulties during the call. 4. Introduce yourself or wait for the host/moderator to introduce you. In some large conference call services, participants who have just entered a live call are introduced by the moderator. This helps other participants keep track of who’s in the call or not to avoid confusion. If the host or moderator doesn’t introduce you, make sure to state your name especially if you’re about to speak. 5. Avoid mumbling and speak loud and clear. When presenting during a conference call, it’s important to speak loudly and clearly so the other participants can hear and understand you. Avoid mumbling your worlds and maintain a stable speech rhythm that is neither too fast nor too slow. You can also try pausing in specific parts to further emphasize a key point. 6. Be wary of dead air. Again, it is easy to get confused in a large conference call since you are unable to see the other participants and can only rely on their voices to confirm their presence. So, if there’s dead-air, the participants might assume that the others have either left or are experiencing technological difficulties. A way to avoid this is by describing what you’re doing to fill them in on what’s happening. 7. Mute your phone, if necessary. Large conference calls generally contain a huge number of participants so there are instances of people overlapping with each other making it almost impossible to figure out what the main speaker is saying. In such cases, having a mute button is vital. This button can also prevent other possible inferences such as background noises. Some large conference call services offer features like “Mute all” that automatically mutes everyone aside from the main speaker. 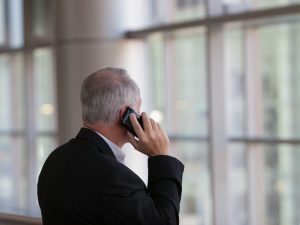 Avoid multitasking when participating in a conference call that contains sensitive information. There’s a high possibility that you might miss important points or reminders that could potentially put you at risk as a result. You must also remember that you were invited for a reason. Make sure to ask questions when necessary and behave just like you would in a traditional meeting.